Hong Kong finally became reunited with China in 1997 after over 150 years of British occupation. Seeing as how it socially, politically, and economically developed in a different manner than the rest of China during such important and rapidly changing historical periods, it can be seen as having already formulated its own identity somewhat separate from that of the rest of the country. Hong Kong’s semi-autonomy institutionalized this in its citizens’ mindset after the reunification, and considering that they are formally an island chain (albeit in extreme close proximity to the mainland), there is also a geographic separation that reinforces their self-identification separateness. Through these means, a sizeable proportion of Hong Kong’s population is influenced by the West and its various mechanisms of projecting such influence (including in ‘democratic’ rhetoric), thus making it the low-hanging fruit of a unified China and subject to extreme outside interference. The primary domestic objectives of the ‘Umbrella Revolution’ is to unleash a contagion of chaos to sweep through coastal China and severely undermine and weaken, if not overthrow, the Communist Party’s leadership. The idea is to create a ‘battering ram’ to break centralized control and initiate a chaotic chain reaction that spreads into all of China’s megalopolises via copycat movements (whether activated Color Revolution sleeper cells or not) and divides the rest of society, even if it is only theoretically 10% of a city’s population in favor of revolution and 90% against it. This strategic societal splitting leads to domestic chaos and a clash of two Chinas – ‘Chinese China’ and ‘Western China’, with the former supporting the Chinese method of democracy and managing affairs while the latter want to brazenly copy the West in all regards (like Russia’s ‘Westernizer’ leadership in the early 1990s, to similar success). 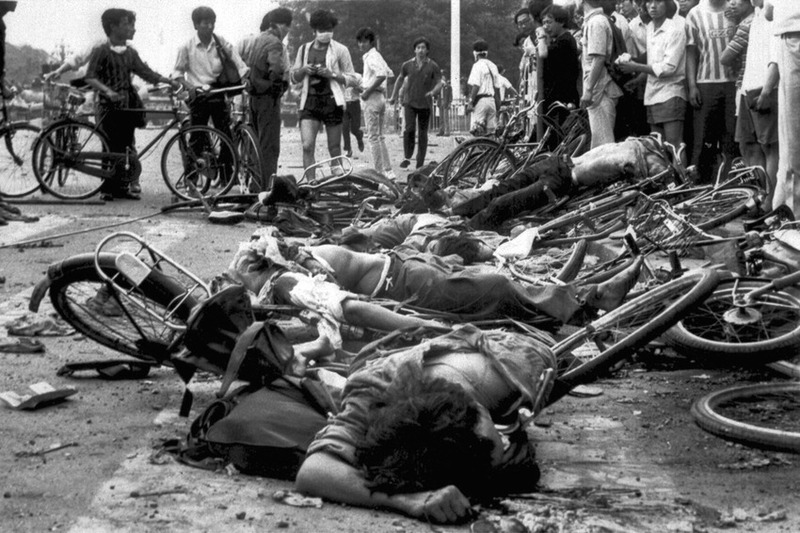 On June 4, 1989, soldiers opened fire on the demonstrators, killing somewhere between 500 and 2500 people. Are protesters trying to reach this situation too? The end result is to create as much domestic chaos as possible to throw the authorities off balance and provoke another Tiananmen Square event. In turn, this can be selectively manipulated by Western media outlets for long-term image advantage and information warfare. CNN has already taken to highlighting the similarities between 1989 and 2014, and the activists themselves seem intent on doing the same, even hoisting the infamous ‘goddess of democracy’ above their gatherings. This is where the umbrella and plastic wrap innovations come into play. By offering the authorities no other non-lethal way to physically respond besides rubber bullets, the chances of this happening increase. Should the ‘Umbrella Revolution’ follow the template of Color Revolutions before it, one can expect ‘mysterious’ snipers to begin shooting indiscriminately at both police and civilians to maximize the chaotic uncertainty and provoke even more panic on the streets. 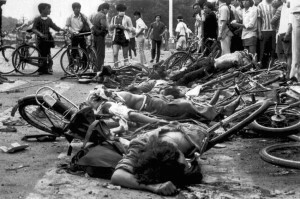 Even if the Color Revolution attempt fails in all of its other objectives, it’s last-ditch intended legacy is to supercede the Tiananmen Square events as an even bigger black eye to China’s international reputation (whether real or perceived/manipulated). On an even larger scale, the ‘Umbrella Revolution’ is intended to both contain and then cut apart China, representing an ominous threat to the country’s international ambitions and even territorial integrity. To begin with, by redirecting the country’s focus back to the coast and away from the South China Sea maritime frontiers, it seeks to strategically distract Beijing in an already vulnerable geopolitical theater at a time of heightened competition and overlapping claims. In a certain way, it is specific iteration of the ‘Reverse Brzezinski’ theorem first postulated this summer in that it creates a US-sponsored ‘damned if you do, damned if you don’t’ dilemma for Beijing. Not only that, but the US has a long-term ‘defensive’ goal of strategic economic diversification away from China and towards the ASEAN countries. 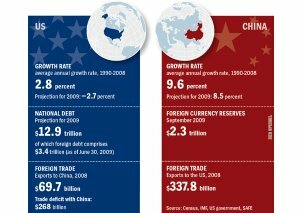 To explain, the US understands that the complex and intimate level of economic interdependence is a vulnerability that constraints itself from more aggressive actions against China. It also wants to create a buffer belt of anti-Chinese states in ASEAN. Thus, it seeks to marry these two goals together by finding ways for Western businesses to relocate from China to Vietnam, for example. It remains to be seen, but if the ‘Umbrella Revolution’ stretches on indefinitely, as EuroMaidan seemed to do, it is only a matter of time before some Western businesses make high-profiled exits from Hong Kong in favor of locales further south. This is but a small development in a very long-term game, but the general idea should be grasped by the reader, and this probable trend is something to monitor going forward. The hype caused by the ‘Umbrella Revolution’ is expected to spread not only to coastal China (as explained previously), but further afield and deeper into the country. Specifically, the US would like to see its pro-separatist policies in Tibet and Xinjiang energized by this movement, hoping that its proxy ‘activists’ take to the streets of Lhasa and Urumqi with umbrellas and plastic wrap themselves. By deflecting the non-lethal crowd control tactics of the Chinese authorities, they too can provoke an escalation that may tragically result in unintended civilian casualties. In fact, looking at it another way, the ‘Umbrella Revolution’ is the first time that the US’ destabilization campaigns have penetrated the Heihe-Tengchong Line. This geographical division divides the country into roughly two geographically equal parts, but with the West having about 6% of the population and the East, the other 94%. Ideally for America, if destabilization can be coordinated on both sides of the Heihi-Tengchong Line between Hong Kong, Tibet, and Xinjiang (not only by their American overseers, but by collaborationist and unwitting domestic organizers within China), then this would be a partial fulfilment of America’s strategic warfare against China, throw Beijing off balance, and reorient the overall Asian initiative against China’s favor. Accordingly, this scenario represents a terrifyingly realistic nightmare for the Communist Party, hence the seriousness with which they are regarding the ‘Umbrella Revolution’. Thus, an analysis of Beijing’s response to the ‘Umbrella Revolution’ takes on even more heightened importance than previously thought, since the movement, as has been argued, could be the spark initiating a larger separatist and anti-government push all throughout the country. With the activists having neutralized all non-lethal methods of crowd control by the authorities through their umbrellas and plastic wrap, the government now stands between two chairs, to quote a Russian saying, where neither capitulation nor escalation is preferable. Thus, as was remarked in Part I, China has opted to wait and see how the movement develops, hoping that the majority of Hong Kong’s citizens which oppose the destabilization will demonstrate their opposition to the Color Revolution and fizzle the event out. This, however, is fraught with risk and could drastically backfire, although in the present circumstances, it may be the only reasonable approach of the country’s leadership at the moment. As the New York Times noted in the above-referenced hyperlink, by choosing such a strategy, the government is effectively ceding the momentum to the movement, which could result in its exponential expansion. Nonetheless, if the Chinese authorities use this extra time to arrest the core and cohorts behind the Color Revolution attempt, then it can adeptly eliminate this threat by leaving only a mass of peaceful and confused civilians sitting around without subversive orders. The government does appear to be making moves in this direction, as the newspaper also reports that it is tracking and monitoring the cell phone activity of certain activists, likely in an attempt to locate and arrest the covert ringleaders (not the red-herring and media-iconic strawmen like Joshua Wong). Beijing’s method of dealing with the crisis also carries with it another risk, namely that the pro-government crowds that it expects to gather could in the long run turn out to be dangerous in their own right. For example, although they may be useful in mitigating the ‘Umbrella Revolution’ and saving Hong Kong’s stability, in the future they could gather on their own (using the connections acquired during their previous activity) to act autonomously and without Beijing’s blessing. This could take the form of extreme and widely broadcasted nationalist protests pertaining to the South China Sea controversy that could disrupt delicate Chinese diplomacy during a future crisis. Of course, the greater question is the extent that China can monitor and influence its citizens (both those that are pro- and anti-government), but this seemingly far-off threat could become a realistic possibility (or even one that could be directed and instigated by outside forces seeking to undermine China) sometime in the future. Basically, by opening the floodgates of activist civil society, China could also be unintentionally opening up a Pandora’s Box. Hong Kong’s ‘Umbrella Revolution’ is undeniably a Western-orchestrated Color Revolution that seeks to exploit legitimate grievances to subversive and possibly secessionist effect. It is divided into two main groups, the dupes and the troops, with both of them having been brought together to form an anti-government mass in the middle of Hong Kong. 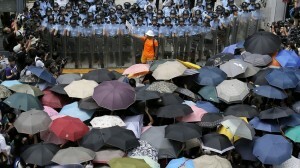 By eliminating the effectiveness of the authorities’ non-lethal crowd control methods through cheap and readily available umbrellas and plastic wrap, they have pressed the government to resort to near-lethal force and rubber bullets if the activists follow through on their occupation threats. Although engineered to create a social contagion to rip through coastal China and the ethnic periphery, the ‘Umbrella Revolution’ succeeds if it can merely create the perception of another Tiananmen Square. Thus, Beijing is faced with a near intractable dilemma in how to proceed, hence its tentative ‘wait and see’ approach. This is, however, but a temporary breather, and both the anti-government activists and the legitimate authorities are likely bracing for what seems to be an inevitable escalation (protester-provoked) that could very well climax in catastrophe.